Arguably, the best honeymoon cruises can be experienced in Greece. The romantic sunsets and the myriad of sailing options around the picturesque islands of the Dodecanese and Cyclades will certainly proof the ideal decor for a holiday of a lifetime. Indeed, honeymoon cruises Greece are tremendously popular. Most of these sailing holiday involve luxury crewed yacht charters, starting from Athens, Paros, Kos, Lefkas or Rhodes. In the Dodecanese (Samos, Kos, Rhodes, Symi, Nisyros, etc), the so-called blue voyages on gulets are ideal. Gulets are classic local built ships, made entirely of wood (pine and oak) and can be luxurious to the point of sheer decadence - sounds really perfect for your romantic honeymoon cruise in Greece, doesn't it? Unfortunately, these motorsailers originate from Bodrum (across the border with Turkey) and few will serve the Cyclades or indeed the rest of Greece. Gulets come in all sizes and various levels of comfort (diving, air-conditioning, chef cook etc). But also the more common sailing yachts (jeanneau, bavaria, oceanis, ocean Star) will be sufficiently luxurious and romantic for honeymoon cruises in Greece. Moreover, these yacht can also be chartered bareboat if one of you has enough experience. On the photo you see our small sailing yacht floating in one of the most beautiful anchorages in the Mediterranean. 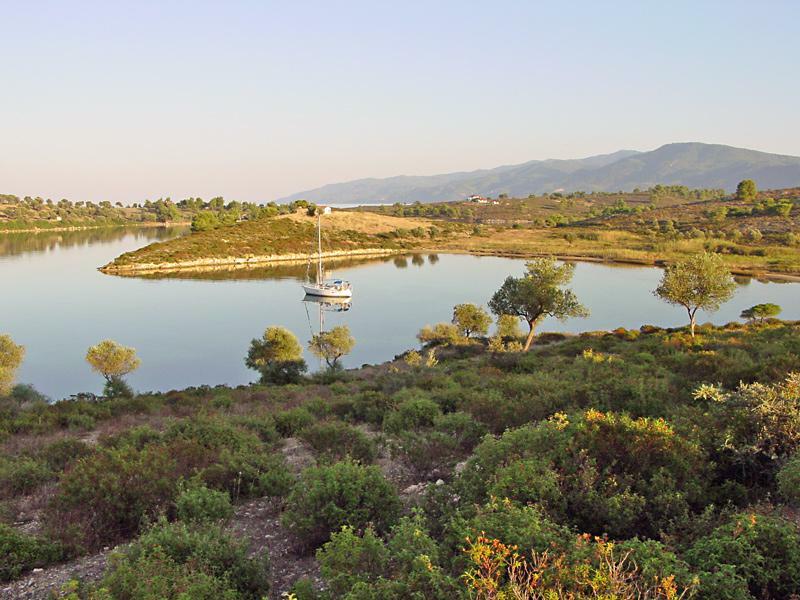 Taking in northern Greece, early September.
.: Back to our romantic sailing cruise in Greece :.